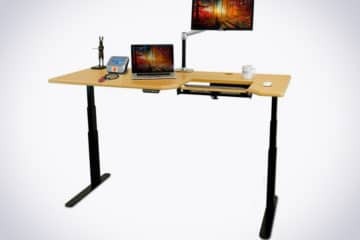 While many features have significantly improved since the inception of standing desk frames, most companies and products still use the same tabletop. Not for the Omega Everest! There are many positive reports about standing desks and how they help with back pain. However, the set up of most keyboard trays had led to a different problem, painful wrists. The Everest by iMovR developed “SteadyType” keyboard trays that allow your wrists to have the same range of motion as when you are sitting and are better far suited for standing desks. This is especially true for treadmill desk users. Walking and typing can be a challenge, and you will find yourself seeking support on the work surface. You end up pressing down hard on your palms to maintain your position on the keyboard while the treadmill is pulling you away from the desk. Typing in this kind of posture for long periods of time eventually puts undue strains on the muscles and tendons in our wrists, arms, and shoulders. If this goes unchecked, it could lead to carpal tunnel, low back pain or rotator cuff soreness. That doesn’t seem to make sense especially because these desks are meant to improve our health. Anyway, let’s take a closer look at the Omega Everest to see what makes it tick! DO NOT MISS: The iMovR Omega Everest made it into our list of the best height adjustable standing desks of 2019, so take a look now! Wood grains: Hayward cherry, almond cherry, sharker cherry, urban walnut, clove mahogany and light maple. iMovR has been in the business of making and selling standing desks and treadmill desks for a long time. They understand that most people are really invested in their office decor, and most people also may not have all the space in the world. They make sure to design all their desk lines to be mixed-and-matched to your heart’s content. They also ensure they produce and ship all the orders within one week regardless of configuration. The Everest Omega desk allows you to pick custom parts, and here are a few things you can select to make the table better suited to your needs. The frame itself can be ordered in either the black or silver powder-coat finish. If losing your cables or finding then strewn all over your work area is a common phenomenon, you need iMovR’s Cable Management Kit. It allows you to store all your cables neatly. These kits are easy to install and include a variety of versatile and reusable components to enable you to quickly reconfigure your cable bundles. There are two types of kits, and you can choose the one that best fits your needs. The basic kit as the name suggests is for lightweight needs. It contains reusable cable ties, magnetic cable guides, and adhesive mounting brackets. The advanced kit comes equipped with a seven-outlet surge protector, a 12-foot power cord, and a 24-inch cable tray. Tired of your old working station? 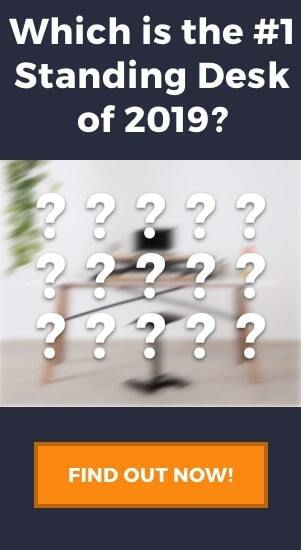 Are you anxious to move your desk to a new spot but it’s too heavy? The iMovR locking caster wheelset is just what you need! All you need to do is to replace your Everest desk’s leveling feet with the caster wheels. The casters are designed to fit into the recessed threading on the feet of your desk. The installation is straightforward. Most of the standard standing desks reach a height of around 48″, this is disadvantageous to people who are as tall as 6’2″, or 5’9″ on a treadmill. The desk will not have meaning if it cannot serve you ergonomically. That is why the standard Everest Stand Up Desk adjusts to 50.5” high, three inches more than the industry standard. It doesn’t stop there, if you feel that height is still insufficient, the iMovR’s Height Extenders are just what you need. These accessories add an extra 4″ to the total desk height. Don’t you just hate it when you have to find an outlet and lay your extension tables all over the floor to reach your desk? Are you tired of people stepping on your cables and unplugging your laptop because they won’t look where they are going? You don’t have to worry anymore. The Omega desk has the option of a grommet-mounted power socket. It brings single AC/dual USB or dual AC outlets to the top of your work table. It is ideal for a multi-person workstation. The Everest sit-stand desk has a lifetime warranty on the steel frame, ten-year warranty for the moving parts and a five-year warranty for the table tops and electronics. Compared to other products this is a very long warranty period. The keyboard tray is essential for protecting your wrists while standing or walking on a treadmill. The Omega Everest has a keyboard tray that allows for a 90-degree rotation. The tray’s dimensions are 19.5” × 10.5”. There are also special pegs on the tray’s surface that ensures your keyboard doesn’t slide down. It also stable and doesn’t shake since it is mounted near the desk’s crossbars. These keyboard features make sure you are more comfortable typing at any height and helps increase your speed and accuracy. 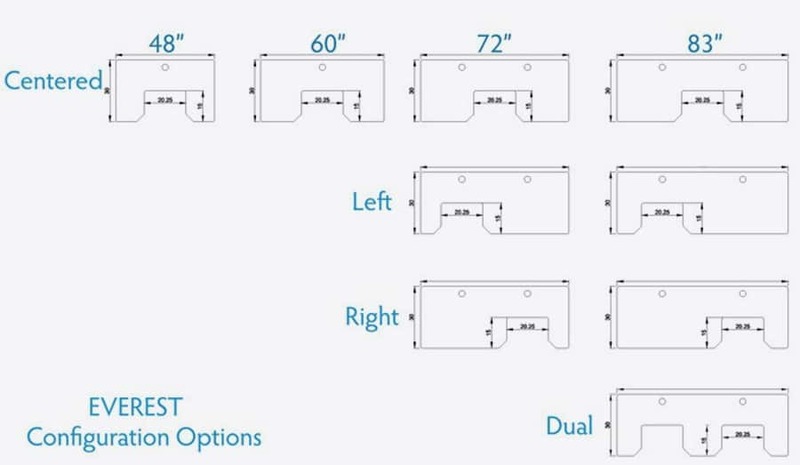 There are also two height settings for you to mount your mounting bracket for the keyboard tray. One is 3/8 inches below the desk surface while the other one is 1-1/8 inches. You will minimize the extension of the upper arm by keeping your hands in a constant arc around your body when mousing. When typing on the more common standing, walking desk, you will find that there may be increasing pressure the wrist. With this desk, you can anchor to the keyboard platform and at the same time keeping your arms at neutral angles. You will also have more of your desk, and the keyboard tray will not be pushing you away. There is almost no shakiness with this even when you type unusually hard. 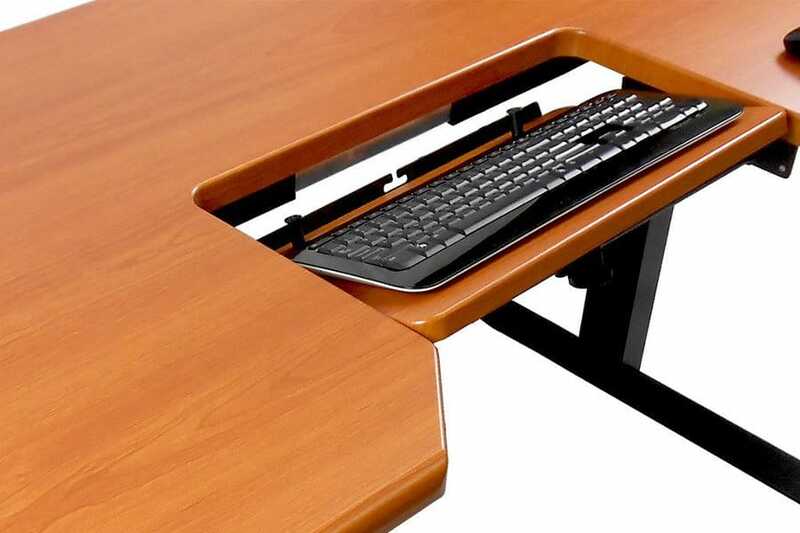 This is because the keyboard platform is attached directly to the desk and is also centrally placed for maximum balance. The desk emits only 46DB when lifting and 42DB, you can barely hear this is in a typical office with background noise and air conditioner. The travel speed of the motor is 1.5 inches per second and has one of the lowest power consumption of electric desks of just 3hp. The magic that produces the Omega Everest happens in Michigan; the American headquarters for office furniture manufacturing. The only imported parts are the Bosch motors. Its quality is incomparable, and this is shown in the length of their warranties. They are the longest around. If you ever need to change your current Omega desk for a bigger or smaller size, you won’t need to get rid of the whole thing to buy a new one. All you need to do is swap the table top for the size you want and adjust the frame accordingly. Installing the Omega Everest desk is not rocket science, it is very straightforward, and the guiding documentation is easy to understand and follow. The desk has also shied away from the archaic predrilled pilot holes for installation. Instead, it has recessed insert nuts and machine screws which are simple to insert. This ensures your tabletop and keyboard try don’t suffer defacing due drilling. You will only come across the pre-drilled holes when mounting the hand controller. The controller is also versatile, for the smaller sizes, you can mount it on the left or right. For the larger versions, you have a third option of having it in the center. Additionally, if you do not want anything to do with assembling, you have an option of ordering an already assembled unit. Neat, right? The most common table top material is PVC and high pressure and vinyl strips along the edges. The Omega table has 3D lamination that covers the table top and the keyboard platform. The 3D lamination is applied by a one of a kind machine. The process starts with the wood slab which is shaped on CNC machines to a precision of 1/5000ths of an inch. “Ergo contour” is also put on all four edges. Once the top is formed, they thermofuse Surf(x) 3D Laminate to the top under high temperature and pressure. This ensures there is a perfect airtight bond all around. The technology also allows the tables to have a gently sloping look on the edges and rounded corners which makes the table more comfortable. Additionally, it preserves the wood grain design. The Omnova Surf(x) 3D laminate used in the Omega desk is more durable and resistant to scratches, chemicals, and dings than more common hard laminate. As a matter of fact, some time back you would have found the laminates being used in hospitals. Hospitals are always using harsh chemicals to clean and disinfect their desktop surfaces. You guessed it, even if you spill bleach on your Omega desk you will not live to see it discolor. 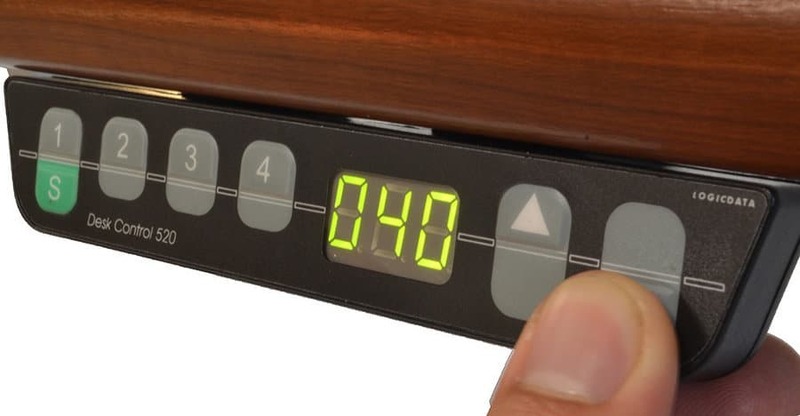 The Omega Everest has a digital controller that has a height readout, and four programmable memory presets. This adjustable desk is one of the tallest in the market. It can have a height of 49 inches that can extend to 53 inches when you use extenders. The competitors average 47 inches. This desk is therefore beneficial to those taller than 6’2” or 5’9” when using a treadmill. The smaller versions of the desk come with one grommet hole, and the larger sizes have two of the holes. All these holes are about three inches wide and covered by 3D lamination. This enables you to see all the natural wood in its glory. You also have access to a dual AC power node that is mounted on a grommet and is a fit for the 3-inch grommet hole. This makes it convenient since you can use your phone and even laptop chargers on the desk. This especially comes in handy for a multi-user workstation. The Everest is NEAT (Non-Exercise Activity Thermogenesis) certified product. It is meant to deal with the adverse health effects of a sedentary lifestyle. TAKE A LOOK: People who like the Omega Everest also like the Jarvis. Have a look at our in-depth review of the Jarvis Standing Desk by Fully here. 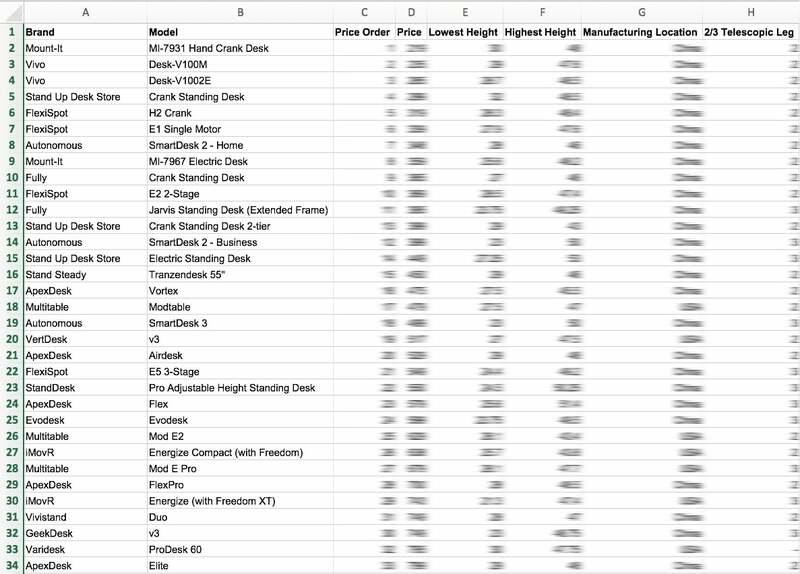 With a starting price of $1200, this desk is one of the most expensive in the market. You will need to evaluate whether you really need its features. If not, you may probably opt for a cheaper alternative. If you have limited space, this may not be ideal for you. The desk can be comparatively larger than other desks and consequently takes up more space. If you do not use a standard keyboard, this desk may not help you much. The Kinesisunless, for instance, is not supported by the desk. Additionally, if you write a lot, this desk may disappoint since the tray may take up some of your potential working space. Keeping healthy is important. With too much sitting being a constant threat to our wellbeing, the standing, walking desks couldn’t have come at a better time. The Omega desk provides you with state of the art features (which by the way, have a pending patent) that ensure you gain the maximum ergonomic benefits from using it. 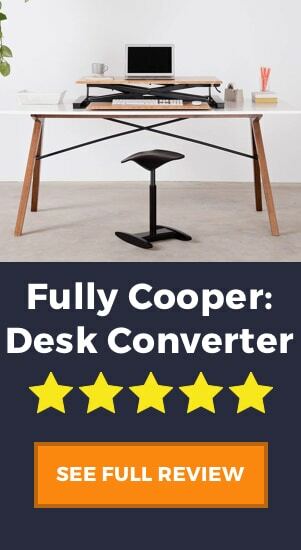 This one of a kind desk will enable you to reach your full potential with its unique design. You will no longer have wrist pain due to typing at an uncomfortable angle. This is all thanks to the 90 degrees rotation feature on the keyboard and the SteadyType embedded keyboard tray. The accessories also allow you to make the desk your own and tailor it to your office needs. There are many standing desks out there but this is one that will serve you for a very long time. With its telescoping base width, even if you move to a smaller or larger office, you will only need to replace the top. That will save you a pretty penny. The desk may have its shortfalls but the benefits you will accrue from it are far greater.